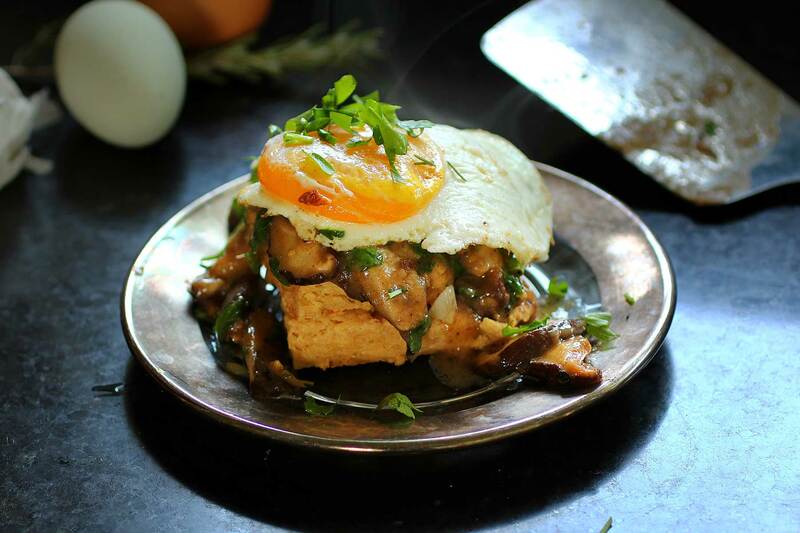 Tender whole wheat yogurt biscuits topped with a silky, flavorful shiitake mushroom gravy. So good and just enough for two. Biscuits do not make good leftovers. But the beauty of the biscuit is you don’t have to make a whole batch. You can be baby bear about your biscuits, always just right. I, on the other hand, am feeling decidedly more Goldilocks after dropping my mother’s camera today. The tripod wasn’t open enough and the whole thing fell, cracking the flash (which I never use). The camera still works, thank goodness, but I was inordinately upset. It’s my mother’s camera. When Mom died it was the only thing that I had to ask for and that I was so careless… It felt like I cracked my mother’s memory. But you’re here for breakfast and all I’m serving is sad. Here’s a fractured fairy tale to lighten the mood. And now, back to biscuits and gravy so tasty I’m wishing I’d made more than just enough for two. I usually do a half and half blend of whole wheat pastry flour and all-purpose. But today I opted for all whole wheat. If you’ve not tried whole wheat pastry flour I encourage you to give it a go, it’s made with soft wheat rather than hard wheat making it much more suitable for biscuits or pastry crusts, more flavor with out being heavy or chewy. I use Bob’s Red Mill as it is readily available here. You will never get lumps in your gravy if you make sure that the flour is thoroughly coated with whatever fat you are using, be it butter, oil, or pan drippings. I like to continue to brown the butter and flour for a few more minutes after incorporated, to lose the flour taste. Combine flour, baking powder, and salt. Stir or whisk to thoroughly combine. Cut in butter (I usually just use my fingers), chilling afterwards if necessary. Add yogurt, starting with four tablespoons and adding more if needed, mix in with fork until dough just comes together. Turn out onto a lightly floured surface and knead 2-6 times until it forms a cohesive dough. Pat out the dough into a seven inch circle or square. But into four roughly equal pieces. Place on a prepared baking sheet (I baked mine in a cast iron skillet) and bake at 400 degrees until lightly brown on the bottom, about 12-15 minutes. Sauté the mushrooms in a dry cast iron skillet over medium heat until they begin to soften and release their juices, about five minutes. Add flour, stirring until no dry bits of flour remain, lower heat slightly, add rosemary and garlic and cook for another minute or two, stirring occasionally. Add sherry, whisking until thoroughly incorporated, add water, bring to a low boil, stirring often until sauce is smooth and desired thickness. 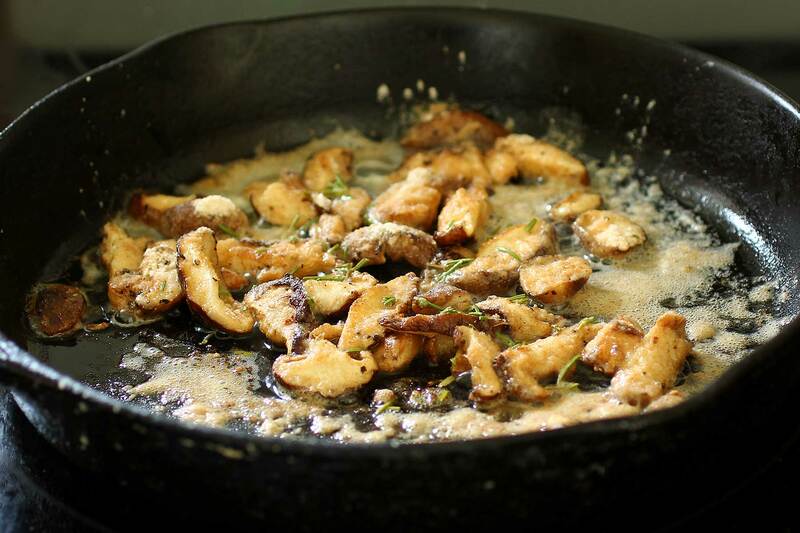 Sauté the mushrooms in a dry cast iron skillet over medium heat until they begin to soften and release their juices, about five minutes. Add butter and stir to combine. Add flour, stirring until no dry bits of flour remain, lower heat slightly, add rosemary and garlic and cook for another minute or two, stirring occasionally. Add sherry, whisking until thoroughly incorporated, add water, bring to a low boil, stirring often until sauce is smooth and desired thickness. Add salt and pepper to taste. 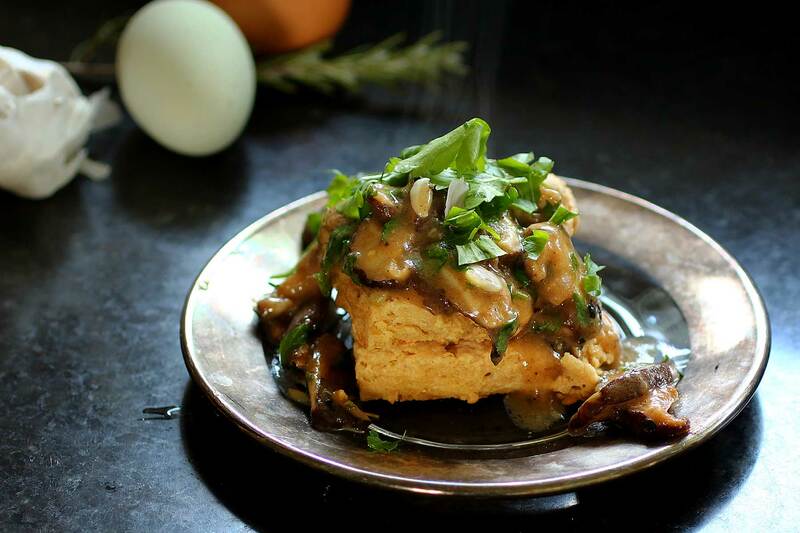 Loving the look and sound of that hearty shiitake mushroom gravy especially. I wish I had a whole plate of it to devour now!